Snapshot for October 22, 2008. Recent news that retail sales dropped 1.2% in September—on top of analysts’ predictions of negative gross domestic product growth in the third quarter—leave little room for doubt that a new serving of stimulus is certainly needed. While Congress may be tempted to model the next round after the last one—that is, emphasizing large tax rebates—the current economy demands a final stimulus package that will provide maximum economic bang for the buck. As money is spent, it creates beneficial ripples through the entire economy. The evidence is that most of the money from the recent tax rebate was saved rather than spent, thus blunting its stimulative benefit.1 By comparison, other options—such as infrastructure spending, aid to states, food stamps, and unemployment insurance (UI) benefits—are much more cost-effective because they target the needs most likely to channel money back into the economy. Mark Zandi from Moody’s Economy.com estimates that each dollar of refundable tax rebates only boosts GDP by about $1.26, while each dollar of infrastructure spending could provide a $1.59 boost. Not only are many of these stimulus options more effective, but they also have the added benefit of assisting those hardest hit by the downturn and tackling long-standing infrastructure needs that would lower transportation costs, decrease traffic, and increase business productivity. 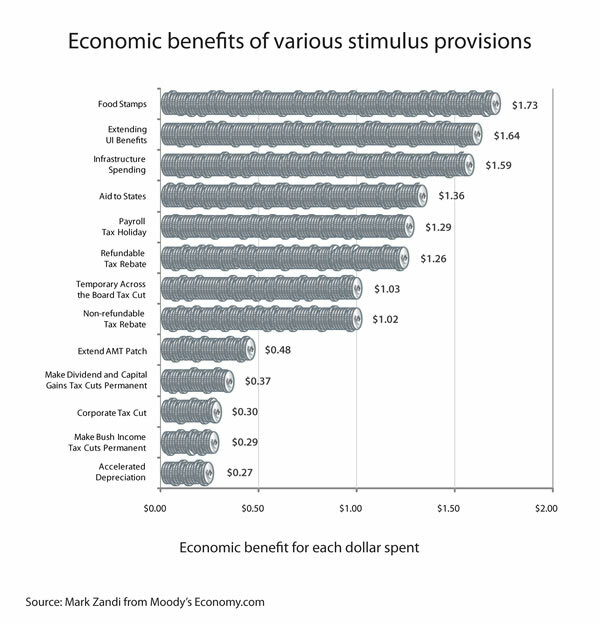 Zandi’s analysis also shows what doesn’t work as stimulus: a variety of tax breaks for corporations and wealthy individuals, which cost over twice as much as they return to the economy.